Your home deserves "more than ordinary" doors. Author Bryant H. McGill once said, “The loss of craftsmanship has turned America into a sweeping, franchised wasteland of disposable goods.” At Vintage Doors, we couldn’t agree more. That's why, for nearly 30 years, our craftsmen have taken great pride in creating real wood doors of heirloom quality, so you can take great pride in owning one for generations. You see, we’re not out to change the world. We’re out to change the way the world notices and appreciates your doors! With many wood choices, styles, shapes and hardware options, Vintage Doors can custom create any design with the BEST time-honored craftsmanship, just like the olden days. Producing masterpieces, you can be wholeheartedly proud of. 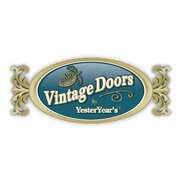 Vintage Doors offers “Extra-Ordinary” designs, artistry and personal service, guaranteed. We love helping homeowners, builders, architects and designers add unparalleled beauty and value to their homes. 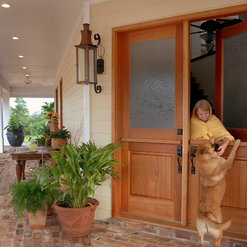 To experience the difference an exceptional door can make (and become the talk of your neighborhood) get planning today! A fantastic product. All of their products actually are great and the craftsmanship is beautiful. They do both excellent quality and excellent quantity. They treated me with a smile and gave me total respect. I will be ordering there again without a doubt. We live in a home built in 1936. It sits on a corner lot and is positioned such that everyone enters through the back. When it came time to replace The back door, I really wanted to get it right. I told around on the Internet using the keywords “vintage” and “doors.” Boy, am I glad I did :-)… I happened upon this very professional looking, user-friendly site vintagedoors.com, and even though my own contractor tried to talk me into something cheaper, I kept going back to that website. Eventually, the desire for exceptional quality of materials and the staff’s eye for design, won out (Thank You, Erica!!!). And thank you Vintage Doors this beautiful African mahogany, beveled glass door that looks like it always should have been there and that is the envy of my friends and neighbors! I ordered a custom door from vintage doors in July 2016; turn around time was 6 weeks; when door finally delivered to NorthEast Kingdom of Vermont it was end of September. After about 3 weeks my builders found the door had a crack right down the middle. Long story short I will NEVER order another door from these people. They said they would send the panel that was cracked. It would take a cabinet maker to fix it and door needed at least 3 coats of staining and the lock set drilled to survive cold winters in Vermont. After inspection of the door my builder said the door especially the "cracked" part was not insulated enough. So basically the door ($3000.00) is unusable. After discussing this situation with owner he threatened me if I wrote a bad review! So I am not afraid to say I was very disappointed in this company. Just make sure you know what you are buying because I didn't and lost a good deal of money here! 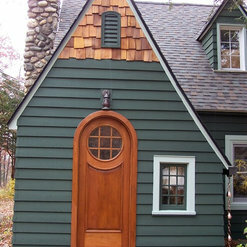 Mrs. Lee ordered a custom exterior Douglas Fir Entry door for her home. A beautiful design! She very specifically requested recessed flat panels, which we do not recommend on exterior 1 3/4" thick doors (as the panels are indeed thinner). To further explain, a flat recessed panel option offers a certain aesthetic that some clients prefer for certain style homes - such as craftsmen style homes. Exterior doors with this type of panel preference should be 2 1/4" thick, to allow for a thicker panel (however, the cost is at a higher premium). With our hand-crafted products, the lead times vary between 6-8 weeks. We were on schedule with Mrs. Lee's order, but due to the fact that she was not always at this specific home, we held the shipment until a time that was convenient for receipt (when someone could be there to accept and inspect the delivery). We go through great lengths to ensure customer satisfaction, especially when it comes time to ship and deliver the finished order. These are natural wooden products, and their timely sealing/finishing is VERY important. We send along care instructions with our products, which includes finishing instructions and finish product recommendations. We speak over the phone with each client to set-up deliveries, and explain clearly that doors must be finished between a 1-2 week period of receipt to ensure the wood does not expand and contract. Unfortunately Mrs. Lee did not follow these instructions, and unfortunately her panel did crack. We are sorry this happened of course, and can only help fix the problem at that point. Despite her very discourteous demeanor, we warrantied the product at no cost - by immediately sending a new panel and moldings for replacement and install. We explained how the replacement would easily be handled and recommended that her contractor call in to speak with us with any questions. Her contractor, we must say, was very cordial and understood the nature of the situation (as a result of not finishing the door soon enough). In closing, the last thing our company wants is an unsatisfied customer. We strive to be understanding, courteous and answer any client inquiries (or concerns) in a quick and comprehensive manner. We do enjoy working with clients who hold the same standard of respect towards our staff as well, which is why the owner here at Vintage Doors had to speak with Mrs. Lee. Despite our efforts, we are deeply disappointed Mrs. Lee would continue to choose to go online to speak poorly of our company. We know she will enjoy her door for years to come. I ordered a Dutch door in knotted Alder for my Southern California 1948 Adobe home and pained over the choices, not wanting to make a mistake in style. Erica and Ashley were both extremely helpful with the details both aesthetically and structurally (with Adobe, there is not room for altering the existing opening, so the door had to fit!) I am incredibly happy with my door, which I had professionally installed. The installer must have commented half a dozen times about what a beautiful, quality door it is. I'm very happy I was patient and ordered my custom door from Vintage. After an initial purchase of almost $3000, I returned to Vintage Doors for a replacement part. Vintage Doors provided a part with a manufacturing flaw. Howard Demick, the owner of the business, demanded that I accept complete responsibility for the repair of their flaw, and when I refused, he refused to discuss the matter further. Vintage Doors then sent a refund for the purchase price of their flawed product, despite my request that they not. I tried having the product repaired locally, at my own cost, but the repair did not return the product to a newly manufactured condition. I returned the refund check, requesting that Vintage Doors send a replacement product, and suggesting an alternative resolution that, I believed, would be mutually acceptable. Vintage Doors refused to consider any alternatives, and in an email that I did not timely receive, gave me three days to contact them. Unfortunately, I was unable to do so. Based on this, Vintage Doors has kept full payment for the product that was manufactured with a flaw. Despite multiple attempts to find a solution, Vintage Doors has refused to respond to my attempts at communication. Additionally, despite verbal assurances that Vintage Doors would provide assistance with replacement parts or supplies for their custom products (when I originally made my $3000 purchase with them), Vintage Doors will no longer accept any orders from me for parts to maintain the original order. For the prices they charge they should probably provide a nicer product. The salesman assured me that purchasing door stops would be advised and that they would not interfere with the door handle. (I sent numerous photos and measurements) After installation the stop DID prove a problem and so the door had to be modified. It was a huge pain. One disappointment in quality workmanship is the beveled edge is not even routed to the corner. Blah and nothing special after spending over a $1000.00 In response to the seller, I have numerous emails and phone call logs about my disappointment with this door. I even sent photos and a video. They never offered anything except excuses. Thank you for your review; we are sorry to learn of these items via Houzz and not through a phone call or email to our customer service team. We do take our client's happiness very seriously. To be clear—Your handle set and any other hardware used to install your new screen door was not purchased through our company (we do have hardware available). We’re sorry if you’re having any issue with hardware purchased elsewhere; however we simply cannot be held responsible for any issues you might be experiencing, as we have many product recommendations and hardware available on our site to fully ensure a smooth installation in accordance with all of the door options chosen (such as door stops). For instance, if you purchased a “surface mounted” style handle-set elsewhere, you may experience an issue installing that specific type if you're also installing door stops and seals—but it is still install-able. We are deeply sorry that you are “disappointed” with the finished product and feel you received a “blah” door. Of course we strive for satisfaction, which is why we encourage each and every client to ask questions and feel comfortable placing their order. With a little more communication, these small items could have easily been clarified and prevented. We ordered a custom storm door with interchangeable glass and screen from Vintage Door. Everyone we interacted with at Vintage Door was interested in ensuring that we received a quality product exactly as we ordered. We could not be happier with this door! Our carpenter who installed it was amazed how well it fit and matched our solid door exactly in pattern. Truly a world-class company. Ordering online can be scary, but not with this company. Fantastic customer care. I needed some spare parts for a storm door purchased a few years ago and received immediate service. I contracted with Vintage Doors for three custom doors as replacements for doors destroyed when a tornado stuck our historic stone home in March of 2012. When the house was built (during the presidency of Thomas Jefferson), all the wood used was logged on the property and transported to the mill and back on ox-drawn sledges. The doors, windows, cabinets, interior partition walls and trim were all walnut. We elected to go with mahogany for the replacement exterior doors as our existing walnut is a distinctly different color than modern walnut. We were able to finish the doors to provide a beautiful match to the existing woodwork. Vintage Doors provided exquisite products that exceeded our expectations, and their huge catalog of options for millwork profiles allowed us to select a very close match to the existing woodwork. Everything was securely crated and arrived in perfect condition, by truck instead of ox-drawn sledge! I will start with buying from Vintage Doors. 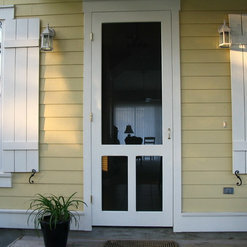 Their website is so easy to choose what screen door you want, then it's up to you to choose the wood. They give you an excellent description on the woods weather you are painting or staining. It took a couple weeks for your doors to be HAND made,but when they arrive they are packaged perfectly there is no damage. They give you specific directions on how to care for your door whether you paint or stain the door. 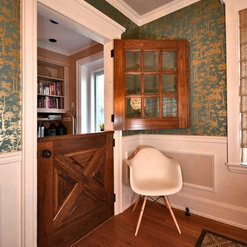 Vintage Doors is a great company to work with! Quality of the doors are Amazing..exactly what I expected and hoped for. Well worth the price. We own a construction Company. We built a carriage house 5 years ago with a beautiful porch with fireplace in the back of the house. We used it but not to the fullest as in the evening the bugs were annoying and in the fall it was to chilly. I saw an ad for Vintage Doors, showed it to my husband and that's when this wonderful, easy new project started. It was just a matter of measuring, picking out the style, wood, screen and whether or not if you wanted to add windows which we did. It was easy and the best way to get a three season room. It's still a back porch but it is also another room. I have added comfortable furniture for sitting around the fireplace plus we can also eat out there and not be bothered by evening bugs in the summer. We just love it! Thank you Vintage Doors for making it so easy. Commented: Console table.We did not make this Dutch door, but it is in our realm of possibilities for sure! Visit us online; we'd love to work with you!